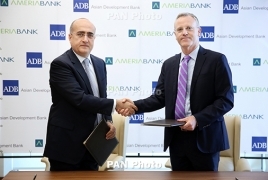 PanARMENIAN.Net - The Asian Development Bank (ADB) and Ameriabank CJSC (AMB) signed an agreement for an equity investment equivalent of $30 million to strengthen Armenia’s banking sector and further promote financial inclusion in the country. This is ADB’s first equity deal in Armenia. ADB has also approved a loan of up to $30 million to Ameriabank. The agreement was signed by Shane Rosental, ADB Country Director and Andrew Mkrtchyan, Chairman of the Ameriabank Board of Directors, at a ceremony in Yerevan. “We are very pleased to be investing in Ameriabank. In partnership with Ameriabank’s dynamic team, we will help provide more credit to small and medium-sized enterprises so they can help contribute to the growth and development of Armenia,” said Mr. Rosental. The vital role of Ameriabank in the development of the Armenian economy and the local banking system, its solid performance results over the last ten years, in addition to its increasingly active role in the well-being of society were the key drivers in the realization of this sizable undertaking. Ameriabank is a leader in the banking system by all main financial indicators. The Bank is the largest lender in the country with assets at the end of 1Q 2018 being USD 1.4 billion. “We highly appreciate this new level of partnership which is a clear reflection of the level of confidence entrusted by ADB towards Ameriabank. This endeavor will create a renewed momentum for the Bank to achieving its strategic goals and long term aspirations, and will accelerate its efforts towards accessing global capital markets in the foreseeable future," said Mkrtchyan. "I am confident that our joint efforts will promote the development of the Armenian banking sector, and will contribute to the economic growth in our country in general, and to the progress of SMEs in particular." Access to finance in Armenia remains a challenge, especially for SMEs and microentrepreneurs, despite their overall significance to Armenia’s economy. SMEs account for the vast majority of enterprises in the country but contribute a disproportionately low amount to gross domestic product (43%) and employment (41.7%). Strengthening the banking sector in Armenia will help improve the availability of credit to SMEs and expand private financial services in the country, while increasing the financing capacity of AMB to serve SMEs. Specifically, the project will enable AMB to provide sustainable financial services to SMEs so they can create more jobs and contribute to the growth and diversification of Armenia’s economy. As part of its financing package, ADB also expects to provide a technical assistance grant to AMB to support digital banking, IT systems, and risk management investments. Eurasian Development Bank (EDB) is an international financial institution established by the Russian Federation and Kazakhstan in January 2006 to promote economic growth in its member states and extend trade and economic ties among them. The bank’s charter capital totals USD 7 billion. Member states are the Republic of Armenia, the Republic of Belarus, the Republic of Kazakhstan, the Republic of Kirgizstan, the Russian Federation and the Republic of Tajikistan. Ameriabank is first investment bank in Armenia, which has been providing a large package of innovative banking services since 2007. Now Ameriabank CJSC is a universal bank offering corporate, investment and retail banking services in a comprehensive package of banking solutions.